It’s Thursday once again which can mean only one thing! It’s one day until the weekend and even better, it means our Dublin Gig Guide is here! We scour the internet to find you all the best gigs and shows on around the city every week! This week is no different with an eclectic mix of stuff on this week – let’s get started! We’ll kick off on Tuesday night as there was slim pickings on Monday evening! Motionless In White will be performing at The Academy on Middle Abbey Street, the American Metalcore band hailing from Scranton, Pennsylvania. With touches of industrial metal MIW have been around since 2005 and have released 4 studio albums. This portion of their UK & Irelsnd tour is in promotion of their most recent release “Graveyard Shift” which came out May 5th 2017! Tickets €25.90! Wednesday night, we’re over to Whelan’s again when This Is The Kit takes to the stage. Promoting their new album “Moonshine Freeze”. Released through Rough Trade Records the band say that Moonshine Freeze “encompass ideas of folklore and oracles, memory, language, secrets, superstition, lives out of sync, and “the strange accidental fortune telling nature of the writing process.” Ideas fed by the writing of Ursula Le Guin and Alan Bennett, the African folk stories collected by the ethnomusicologist Hugh Tracey, by grey coastal days and the taste of blood and copper coins.” So make of that what you will, and get down to Whelan’s to catch them live! 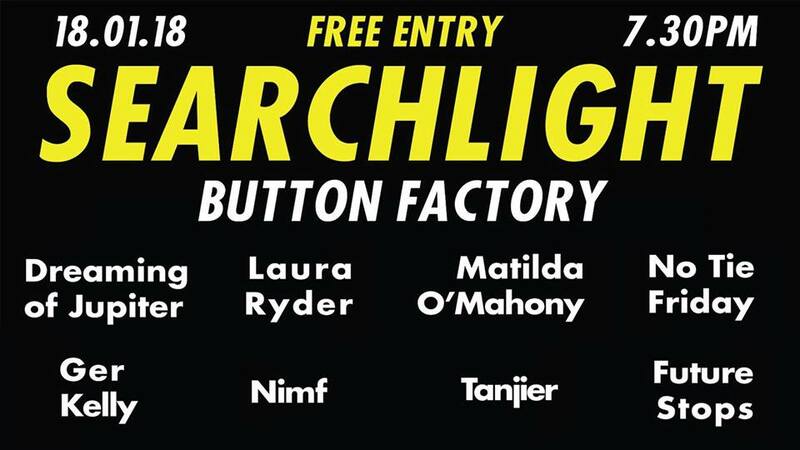 Thursday night, Searchlight returns to the Button Factory! For those of you who have been living under a rock for the past few years, the Searchlight deal is still as packed as ever; this year three acts getting three months of preproduction for studio recordings and live performances with the Sound Training College students. They record two tracks with Sound Training Productions, which are mixed and then mastered by Fergal Davis. All acts undergo intensive preparation for their live show, all culminating in the Searchlight Showcase on the 18th January 2018. Be sure to check out some of the best up and coming Irish bands! The Kooks will also play a sold out show on Thursday night as part of a 3-night slot at the Olympia Theatre. One band who have been going strong off the back of the NME indie-rock wave of the early noughties. These days they have three more studio albums, a number of massive world tours, awards and critical acclaim under their belts, it was clear that the indie rockers’ ten-year anniversary is a significant occasion to celebrate their momentous career so far with a tour of all of their greatest hits. Fans will be given the chance to see performances of classic hits, B-Sides as well as brand new music that the band have been dedicating time to in the studio this year! All tickets for each night are sold out! Three Trapped Tigers also play The Bowery on Thursday night! A great band that you should certainly check out live if you can! Kicking off the weekend, Shadow Child performs the Button Factory on Friday night! One of the most prolific producers in the UK, Simon Neale aka Shadow Child returns to Dublin for a massive show at the Button Factory! Having played a lead role in the UK dance music scene over the past decade, Shadow Child has continuously managed to surprise his loyal fan base with fresh takes on various electronic music stylings. Tickets info here! Little Green Cars will be playing at the Pavilion Theatre in Dun Laoghaire again, the first of a 2-night sold out stint, and Megacone will be performing at Sin é alongside Fanacanta. Megacone are a 6 piece instrumental band from Dublin, and are best known for their triple lead guitars and energetic live show. Megacone combine strong, memorable melodies with addictive grooves and ambient soundscapes. This has earned them a loyal fanbase and escalated them from 5 ambitious music students into professional entertainers capable of enthralling a festival crowd of thousands! Fanacanta provide the support on the night! Saturday, District 8 is the only place to be where Helana Hauff & DeFeKT will be banging out tunes until the early hours. Experimentla electro is the order of the day with Hauff, while DefeKT will be playing his usual style of Techno! Doors from 11pm! And closing out the weekend we have Mary Coughlan. Ireland’s most foremost jazz & blues female singer and performer returns to Dublin’s premier live music venue Vicar Street on Sunday 21st January 2018. “Dubbed as Ireland’s Billie Holiday, Mary is a jazz & blues singer whose life story gives weight to the truth that the best singers are the ones with the most painful lives” (The Guardian). Whether into folk, blues or jazz, no one can fail to be moved by the emotional depth, expression & power in her voice, forged from an extraordinary life. So that’s it from us folks! Our picks for this week : God Mother/Ilenkus/Destriers @ Whelan’s, Searchlight @ Button Factory, Megacone @ Sin é!